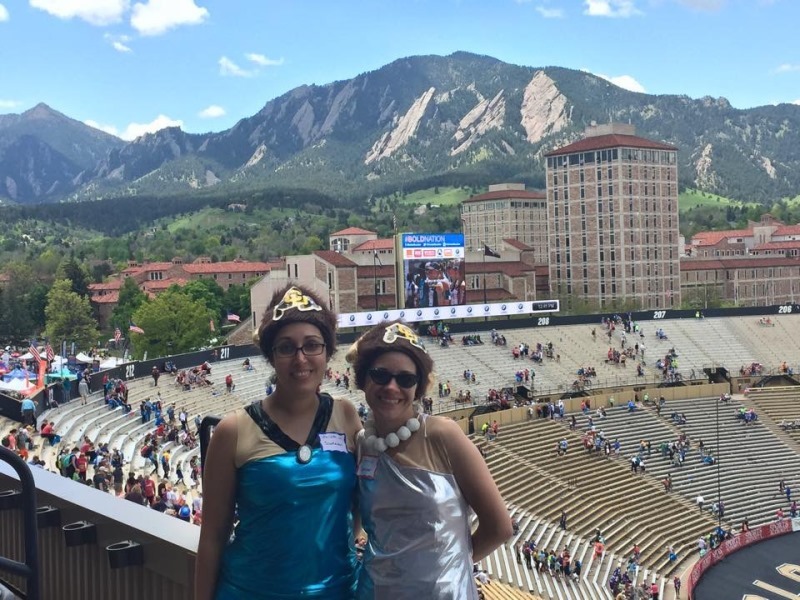 This was my second year running the BoulderBOULDER, and it was super extra special because Meridith and I ran it together. I cannot even tell you all how excited I was to have her come visit me and run with her again, especially so soon after our last visit in A.C! That never happens! She handled the altitude like a champ, too, and the hills weren’t too crazy. We had the most fun of anyone on the course, natch, and we have the photos to prove it. 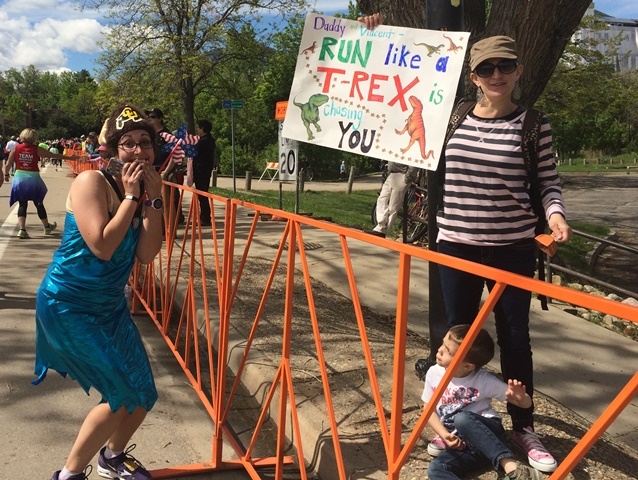 Our fun always begins with the perfect outfit, and there was really only one choice for the BolderBOULDER. This race is huge. Like, not just big, but massive. It attracts around 50k participants and 50k spectators. This uber organized race does quite a bit to make it easy for runners to have a good time, things like advanced packet pickup and race day registration. The crowds are no joke, and it seemed a little more packed than last year which added to the legendary party feel of the race. 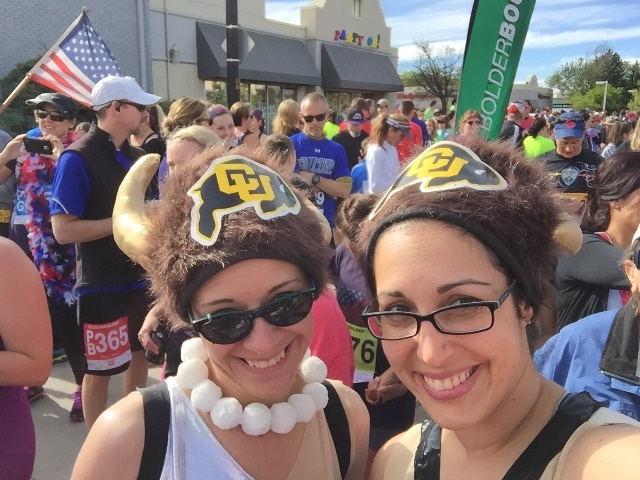 Go CU Buffaloes! The hats make the outfit. Getting closer to the start! So many waves still to run! Once our wave started and the crowd thinned out a little we were able to jog. The weather had stopped being a jerk for the morning and we were feeling good through the first half mile. Pretty quickly we caught up to a group of Fire Fighters and Police Officers running the race in full gear and carrying a flag. It was inspiring, and made me feel like a schmuck for complaining about being chilled before the race. These folks are tough! 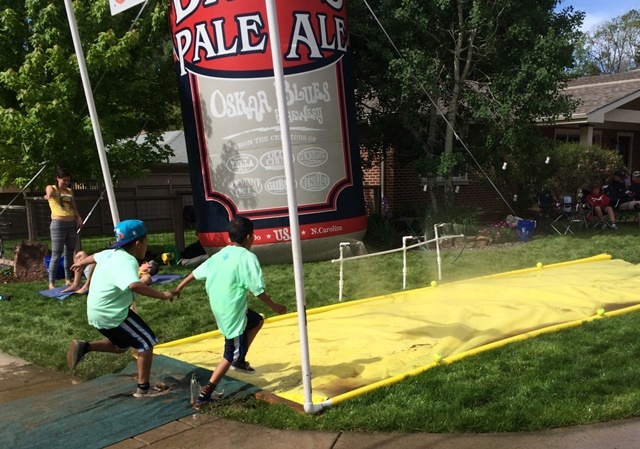 They even went through the first of 2 homemade slip-and-slides in their gear. This race requires a sense of fun from all participants! Soon after, we were approaching our first hill up Folsom and into the residential section of the course (the fun part, really). One of the best things about this race is the organizers have bands playing every so often along the course, but the residents of Boulder step up and provide a TON of runner support and entertainment out of the goodness of their hearts. 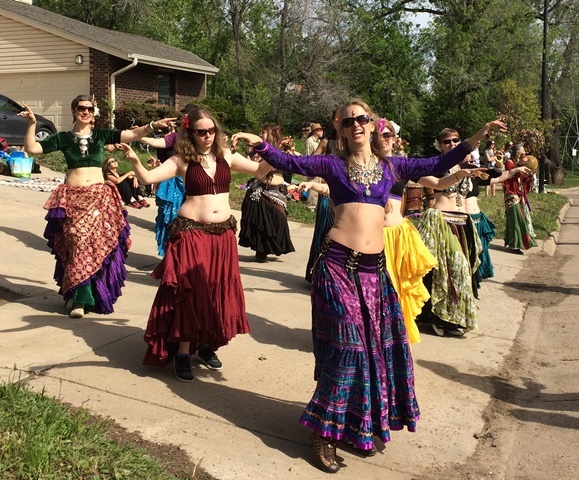 There’s never a moment when you don’t hear live music, whether professionals, garage bands, or belly dancers and drum circles. Just a homemade Slip and Slide. In some dude’s front lawn. For 50k people to run through. And some random dude with his dunk tank. Through the neighborhoods we went, passing up the Jello and Drambuie shots that were offered to us. We heard there was someone handing out bacon but we sadly didn’t see him. We did a lot of bobbing and weaving, and Mer and I got separated a few times, but only briefly. The lesson here is you want to run this race, like, actually move forward at a pace that is faster than a meander, you need to get in a qualified wave. We registered as “jogging/walking mostly jogging, and there was mostly walking going on around us, which is fine, if the walking occurs on the sides of the street. It really made no difference, though, because we had the most fun of anyone on the course. That’s always the goal! 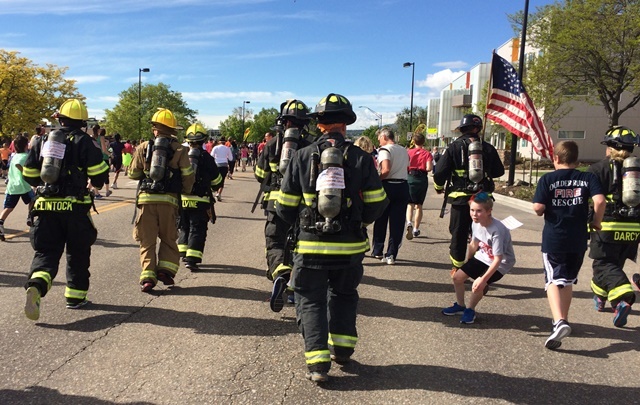 We came into the last mile of the course and found the Firefighters again. Hearing bagpipes playing Taps, they stopped, and Meri and I had to stop for a moment too. It was a touching Memorial Day tribute. Just a few more meters to go and we’d be turning into the University of Colorado’s Folsom Field. 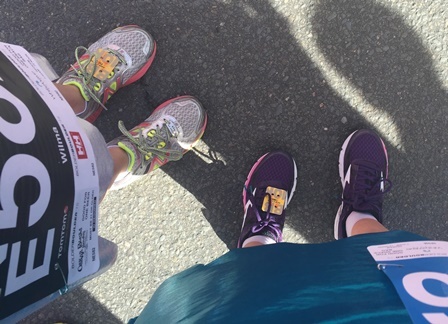 We picked up our pace as best we could in the crowd and ran into the stadium. 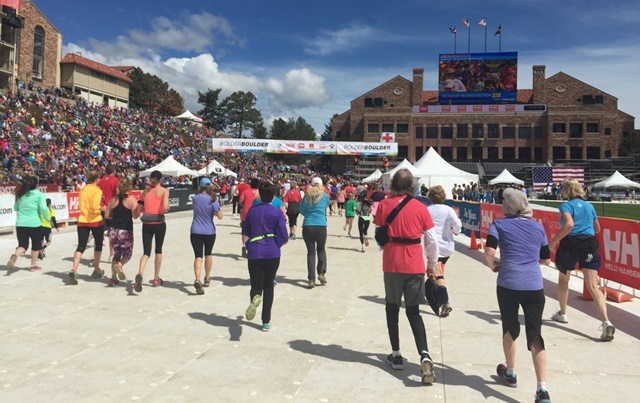 Running into the stadium with all of those people watching and cheering is a rare experience, and something that certainly sets this race apart. The fine folks with the BolderBOULDER fed us, and gave us some excellent seats to watch the International Team runners finish. 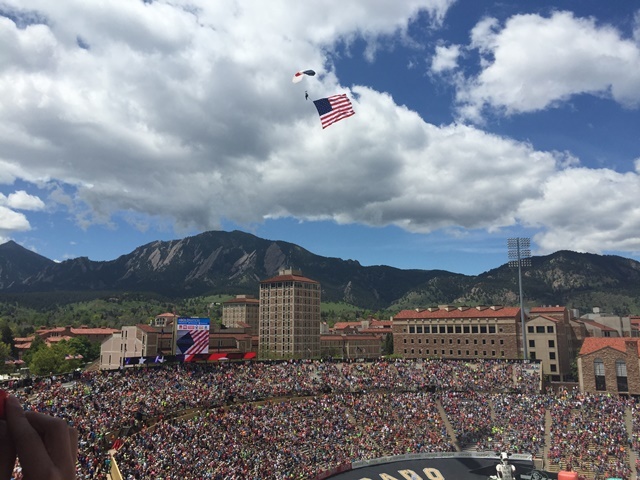 The Memorial day celebration at this event is touted to be the largest in the country, and after seeing it myself, I believe that may be true.There was a touching tribute to 4 WWII Veterans, and skydivers carrying the flags of each branch of service, as well as the United States Flag and a POW Flag. 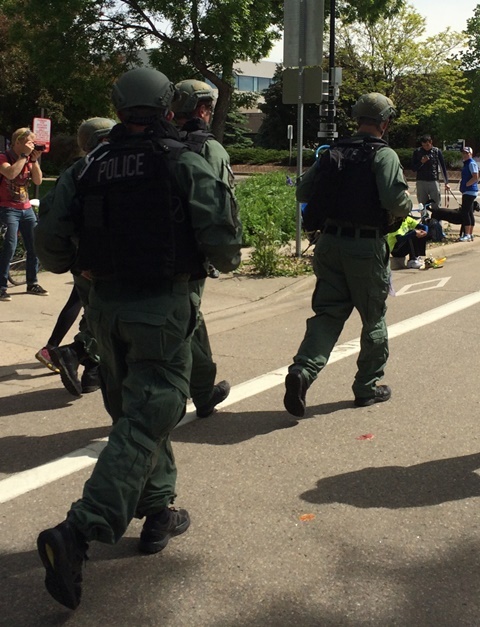 The folks at the BolderBOULDER have been really great to me this year, and I want to say how grateful I am to have worked with them in 2015. Despite the crowd and the confusion about the shuttles back to the starting line, we made it work and had fun. I grew up with this race in my backyard so I feel a certain pride about its popularity. 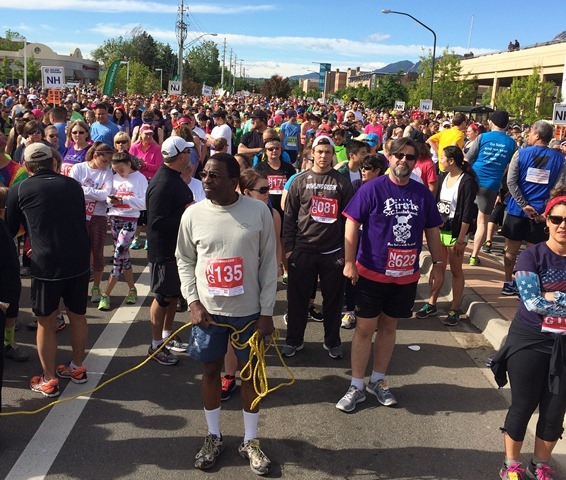 It’s a legendary race that you should do if you can. The setting and the crowd support is unlike any other race in the country! 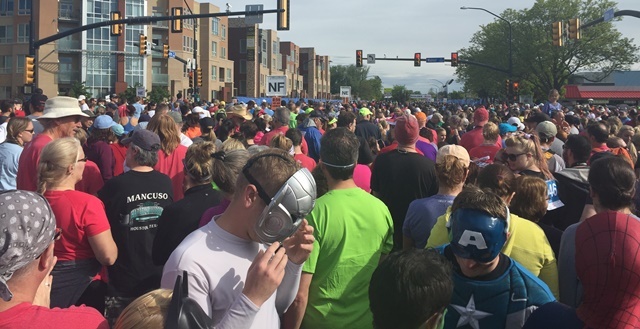 This entry was posted in Race Recap and tagged 10k, America's Best 10K, BB10K, BolderBOULDER, Colorado, fitness, health, race recap, run, running, Skechers Performance, TomTom. Bookmark the permalink. ← It’s My Birthday and I’ll Giveaway If I Want To! 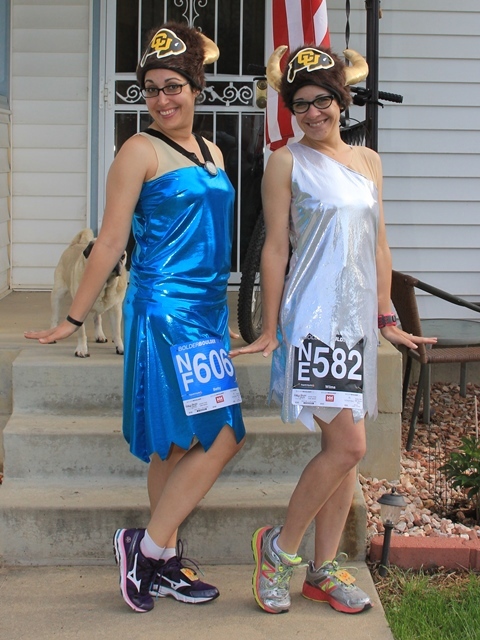 I know I might have said this a few (okay, like 70) times but I had so much fun running this race with you! Your tip about arriving a few days early to get acclimated to the altitude was a huge help and I’m glad I listened. Coming from super duper flat land to well, the mountains, is no joke. I was chugging water like it was beer (without the fun side effects, other than peeing every ten minutes) but yes, that helped! Plus, more time together! Thanks MOM!! I love seeing your daughter, no matter where in the world she is! <3 She's the bestest and the funnest. So glad you two had such a good time. Looks like a great race! Love your costumes! I was awesome, Bonnie! We sorta loved our costumes too. I was yelling Yabbadabbadoo quite a lot. Fun, fun, fun! I’ve always wanted to go to Colorado but man that altitude intimidates me! It’s a blast, Karen! And as long as you take some precautions, the altitude can be dealt with. The trick is to come a few days before the race to let your body acclimate a little, then you should be fine! I hope to see you here some day!